Hanoi (VNA) - The People’s Court of outlying My Duc district of Hanoi on August 8 pronounced sentences at the first instance trial on law violations regarding land management in the district’s Dong Tam commune. Accordingly, 10 faced the charge of abusing position and power while on duty in pursuant to Article 281 of the Penal Code. 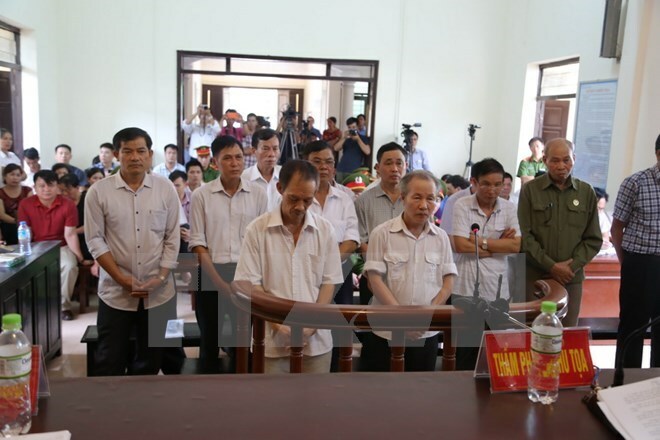 They included three former chairmen of the Dong Tam communal People’s Committee Nguyen Van Son, Le Dinh Thuan and Nguyen Van Bot who received 36-month and 42-month sentences and a 18-month suspended sentence, respectively. Others were sentenced to 24 months – 78 months in jail. On charge of showing “irresponsibility causing serious consequences”, Pham Huu Sach, former head of My Duc district’s Environment and Natural Resources Division, and Tran Trung Tan, an official of the district’s Land Registration Office, were granted a 24-month suspended sentence. Dinh Van Dung, former director of My Duc district’s Land Registration Office; and Bach Van Dong, former deputy director of the district’s Land Registration Office, were sentenced to 36 months and 30 months in prison, respectively. According to the indictment, between 2002 and 2013, Bot, Son, Thuan, and other key officials of Dong Tam commune illegally allocated and granted land to some local households, or legalised land that some households occupied illegally. The four indicted district officials did not fulfil their responsibility for verifying the origin of the land, resulting in the unlawful granting of land-use certificates. Dong Tam Commune’s People Committee got approval from the People’s Committee of former Ha Tay province to allocate 5,425 sq.m of land managed by the commune People’s Committee to 49 local households for housing. Bot, as chairman of the Dong Tam commune People’s Committee, and Truong as official in charge of land registration, handed over 4,095 sq.m of land to only 39 out of the 49 eligible households. When Son took over the post of chairman of the Dong Tam Commune in 2002, he agreed to grant the remaining 1,300 sq.m of land to ten key officials of the commune, who had to pay only 100,000 VND per sq.m. Between 2011-2013, Dong Tam People’s Committee officials also helped with the legalisation of applications for land-use certificates of 12 households for total area of 1,834 sq.m which were allocated or illegally occupied during 2002-2003. Truong, as the local land registration official, gave his confirmation in the applications that the land of the households was granted before October 15, 1993 and there was no dispute concerning the land. Thuan, as the then Chairman of the commune People’s Committee, approved the applications to be submitted to the district’s administration. Authorised district officials approved the applications without conducting required verification. The violations of the officials were detected and investigated following complaints from residents. Dong Tam commune made headlines in local media for a land scandal in late March and mid-April when 38 civil servants and some police personnel were held hostage by the commune’s residents. The residents were protesting what they considered was unjustified revoking of land where they’d built homes and lived for many years. As tensions escalated in March, police opened an investigation against the residents for "disturbing social order."